‘The Baptism of Jesus’ | The Old Adam Lives! 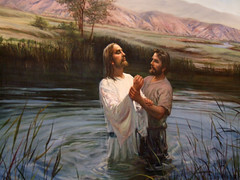 This was not the sermon for the 2nd Sunday in Lent 2011, but it is a Lenten sermon about Holy Baptism. Yes, “Holy Baptism”. Baptism is an act that God performs for us, so it is set apart for God’s special purpose, which more than qualifies it to be “Holy”. Yesterday while driving to church, my wife and I were listening to a radio preacher who has a program called ‘The Jesus Christ Show’, where he speaks and takes caller’s questions as though he were the person of Jesus Christ. He says things like this, “I walked on the water in order to…” Anyway, a caller called in to ask about baptism, infant baptism, etc., and this radio preacher proceeded to demolish baptism as an act of God and made the thing into into an act of faith on the part of believer. Wrong, wrong, wrong, wrong, wrong. This heretic radio preacher proceeded to rob the assurance, that God wants His children to have, right from under them. It was sickening. But hey, that’s what Southern Baptist (non-denominational) preachers do, they turn the whole thing (Christian faith) into a spiritual ladder climbing project that focuses on ‘your faith’, ‘your seriousness’, ‘your feelings’, ‘your whatevers’. It always ends up that way. For those of you expecting to hear yesterday’s sermon, the master (CD) was inadvertantly taken home by a parishoner. Once I get it back, I’ll put it up for you. If anyone wants to defend heretical forms of baptism such as “believer’s baptism”, feel free to chime in. We may not love heresies, but we love heretics, and we’re always happy to fill you in on what the Bible has to say about these bones of contention that we have together. And we are not afraid to do a little theology in order to make the Bible more clear in bringing forth Christ and His great love for sinners. Thanks to flickr and Travis S. for the photo. so you’re saying baptism is less about a statement of faith and more a way that God transforms believers? I’m not picking you apart – I just want to understand what the significance of baptism is in your view, as it wasn’t totally clear in the post. It’s not about a statement of faith, at all. Jesus commanded that we baptize. He was not into empty religious ritual for rituals sake. He commanded it, so He’s in it, doing something for us. He adopts us in Baptism. He gives us His name, He gives us the assurance that He is always for us. He forgives our sin in Baptism (Acts 2:38) or (3:28 – I always get that transposed). He gives us the Holy Spirit in Baptism. St. Paul says in Romans 6 that God puts us to death (the sinful self) in Baptism, and raises us to new life. Just a few, for now. I’m late and have to head out the door. I’ll check back when I get in alter this afternoon. I thought Stephen stated the Lutheran position quite well, indeed.